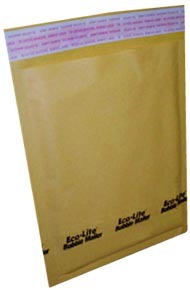 Ecolite™ brand self sealing bubble mailers are made using high quality Kraft™ paper, each has "finned" edges for extra edge protection and contain one continuous layer of quality bubble cushioning that wraps all the way around the inside of the mailer. Not just two layers fused together like many of the others. There is no printing on the address label side. Inside dimensions of 14 1/4" x 19 1/8"